Our car stopped at a red light while we were on the way to KFC. I was starving and I could think of nothing but eating. =-O =-O =-O... it would really make u turn around! yehey, at last, for the first time here, FC! FC! Recent blog post: drawing with words: vampire..
:'( :'( :'( :'( :'( GG! I have to rush out a PB now Mon, due oredi today LOL!!! Recent blog post: Amos FIRST dental check up !! Recent blog post: Wordless Wednesday - Give me the green light! I also don't know why he pakai like that Mariuca.. ROTFLMAO! you just got up Mariuca? did u receive my msg, "chopping time"? ROTFLMAO!! U mean he was happily and confidently hanging out there dressed like dat? Muahahahhahahah! I wanna be ur Queen here Mon!!! Eh how many points oredi I have on ur SB? hmmm I don't think it's nice to make fun of people like them. :-D :-D :-D *rolling smiley* please! LOL! Poor guy, where is his mind? May be he has lost it. CHOP! Come on over Mon! It's so gay. That guy just come out from Malaysia Idol audition? Haha. 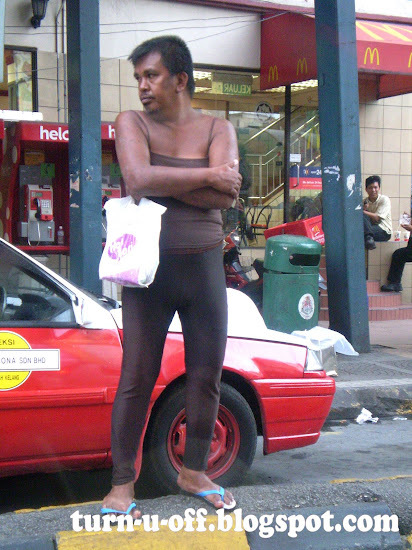 What is he doing in front of Petaling Street wearing that shirt? Get attraction after failing the audition? How come this attire is acceptable in this country? The police don't ask for ID? Recent blog post: Sears Does It Again!!! Wow, is that the latest in men's fashion? LOL! talking of it te mon,,tomorrow is earth hour, ayt!?!??! no blogging!!! Recent blog post: Do You Support Earth Hour? HA HA HA HA! that was a good one, Mon! this guy can be spotted around batu caves,sri gombak,sentul and selayang.